It feels like my daughter and I have literally circled the globe over the past year. We have visited family in Canada, England, Australia, and Mexico. In addition to planes, trains, and automobiles, we’ve traveled on buses, boats, and taxis! Even though it’s been exciting for both of us to learn about some new places, traveling has been a stressful experience for my daughter. Before each trip, we talk about how we are going to get there. We act out how we will get into a taxi, board an airplane, and drive in a car to get to our final destination. As a dedicated student of yoga, I thought that introducing some transportation-related yoga poses might help with the stress. Balance on your buttocks with your arms and legs straight out in front of you, in a V shape. Keep a straight spine and open chest. Then pretend to rock in the water like a boat. From Downward-Facing Dog Pose, come forward to balance on your palms and on your bent toes in a plank position. Keep your arms straight and your back long and flat. Pretend to be a surfboard gliding through the water. From a standing position, step one foot back, pointing your toe slightly outwards. Take your arms up parallel to the ground, bend at your waist, and tilt your upper body to the side. Reach your front hand to gently rest on your shin and reach your other arm straight up. Pretend to be a sailboat gliding through the water. Switch sides and repeat the steps. Sit with a tall spine and your legs straight out in front of you. Move your hands like the wheels of a train going down the track. From Downward-Facing Dog Pose, step your right foot forward to rest just inside your right hand. Keep a flat back and open your chest. Pretend to be a motorbike cruising down the road. Switch sides and repeat the steps. 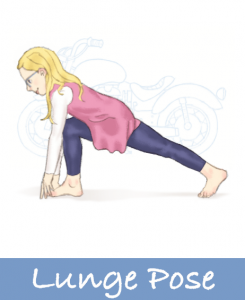 Act out various modes of transport with easy yoga poses! Pretend to be a sailboat, skateboard, and scooter! 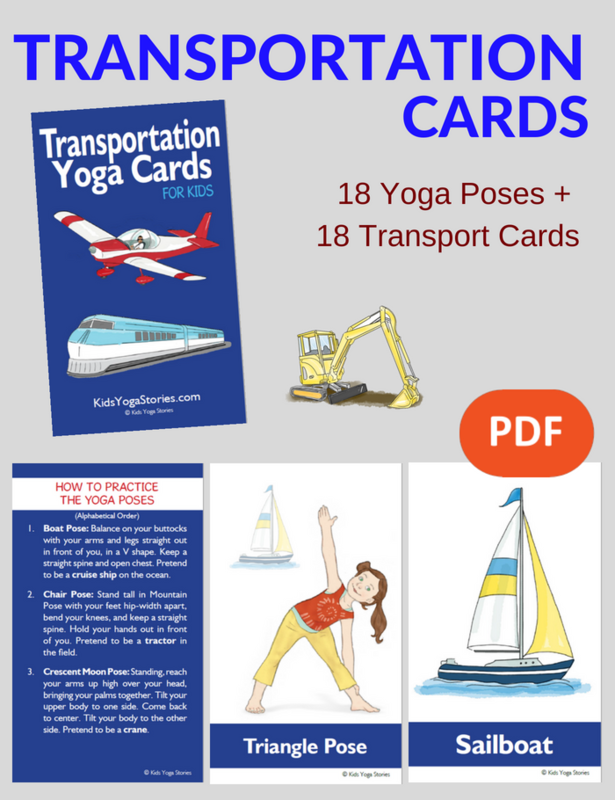 Instantly download these 48 transportation yoga cards to learn through movement in your home, classroom, or studio. Includes an Index Card, Yoga Tips, Pose Instructions, 18 Yoga Pose Cards, and 20 matching Transportation Cards. The multicultural yoga kids are from seven countries. Ages 3+. 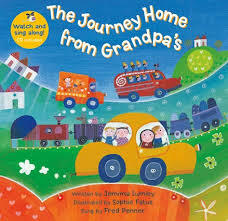 Enjoy practicing these easy yoga poses as you sing along and act out The Journey Home from Grandpa’s, by Jemina Lumley and Sophie Fatus (Amazon affiliate link). 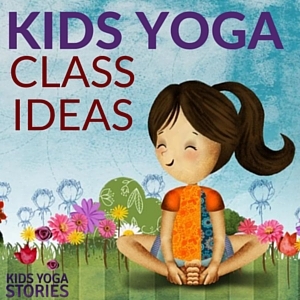 Use these yoga poses for kids as a guide or invent your own yoga poses inspired by the various modes of transportation found in this book. Your children may not do all the yoga poses during the first reading, so simply follow their energy and interest level. Even just a couple of poses is great. 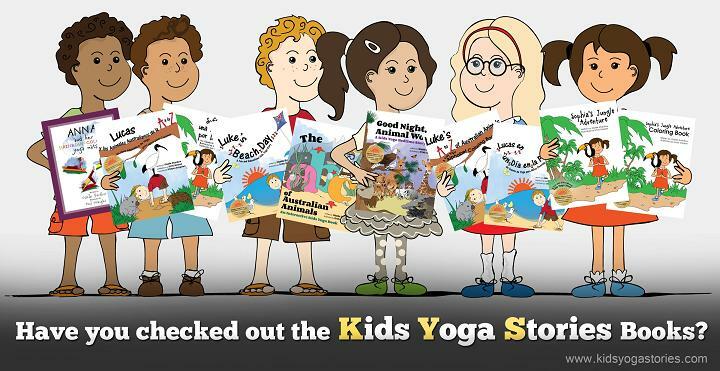 The purpose of yoga for children is to get them active when reading the book to bring the story alive. To start, clear a space and wear comfortable clothing. Stand tall with legs hip-width apart and, feet facing forward. Grasp a pretend steering wheel as if you are driving a car. Stand tall with legs hip-width apart, feet facing forward, and knees slightly bent. Swing your arms back and forth like the blades of a helicopter. Sit with a tall spine with your legs straight out in front of you. Use your hands to mimic the wheels of the train going around and around. Stand tall in Mountain Pose with your feet hip-width apart. Bend your knees, take your hands out in front of you, and pretend to hold onto the steering wheel of a tractor. From Mountain Pose, bend your upper body, reach for your toes, and pretend to dig up sand like a digger. From Mountain Pose, reach your arms high over your head, bringing your palms together. Tilt your upper body to one side. Come back to center. Tilt your body to the other side, pretending that you are a crane. Balance on your buttocks with your legs up. Then rock like a boat in the water. Sit comfortably cross-legged and take your hands out in front of you, as if you are driving a truck. 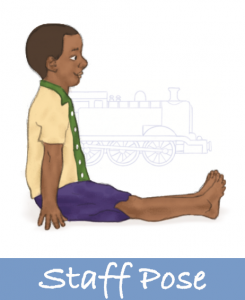 Sit comfortably cross-legged then twist to each side as if you are looking both ways while driving your fire engine. Lie on your back with your arms and legs stretched out. Breathe and rest. 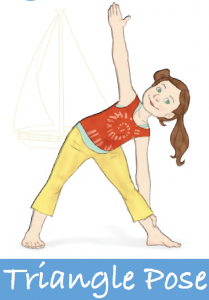 See our List of Yoga Pose for Kids for images and descriptions. Take 1 jeep on a safari in KENYA. Fly on 2 planes to the outback of AUSTRALIA. Ride in 3 different buses to get across the countryside of VIETNAM. Take 4 taxis to get through hectic traffic in INDIA. Fly in 5 helicopters over the volcanoes in GUATEMALA. Join 6 snowboarders sliding down the mountains in CANADA. Take 7 trains to Macchu Pichu in PERU. Gather 8 rafts together to experience the rushing river in the USA. See 9 boats winding down the channels in ENGLAND. Rent 10 bicycles on the pathways in HOLLAND. Very cool! This looks like a great resource! Thanks so much, Beth! Let me know if you use any of the ideas! Um, I think you actually have circled the globe!! 🙂 This is such a great idea and great way to prepare an anxious little one for an upcoming trip! Thanks for sharing this at Booknificent Thursday this week! I’ve pinned it so I can find it for our next trip. This is awesome!! I’m sharing! This was so much fun. I just used these poses with my 2 kids and they loved it. Thanks!